I hope you are well dear readers. I am having a grand, but strange day right now. I have a new hobby. I don’t know if you can call something that has absorbed all my thought for several days a hobby (I tend to obsess over things), but I intend it as a hobby. When I was small, I loved watching late night television. It was not just any program that interested me, I needed horror. I needed to sink my fangs into something scary–the spookier the better! I’ve mentioned that I wanted to be a mad scientist as a child. I did not explain that this was so I could live i the same world as the monsters I adored from media. My child brain assumed the horror hosts like the Cryptkeeper of Tales from the Crypt, Big Chuck and Lil John from the show of the same name and the other horror hosts lived in the same world as the monsters. 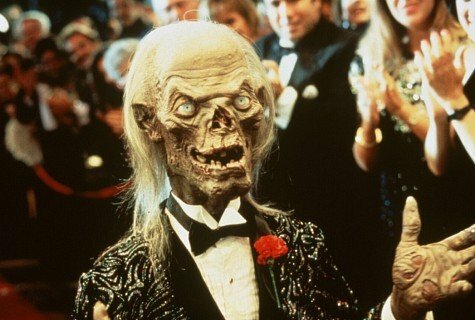 Some of the hosts were monsters themselves (Cryptkeeper, Vampira). I didn’t know how one might become a monster, but I knew that mad scientists were often stars of the show. I knew that they went around creating monsters from nothing. It wasn’t long before I had decided this was my path. My career choice set, I tried many, many, MANY ways to become a mad scientist. This post is not about those. I might do a post about those adventures later if anyone is interested, but today’s post is not that post. I only mention my childhood obsession to explain my new hobby. I am going to become a horror host. If you don’t know what that is, I am so sorry. Please go google it or watch American Scary on amazon/iTunes/your media provider of choice. Normal is just an illusion. What is normal to the spider is chaos to the fly. The it’s no good monster mucks about in creative spaces. It boldly declares that art isn’t good enough. It criticizes the particulars of each piece with distinctive viciousness. It does not sleep; it needs no rest. It is always at the ready wherever and whenever art is being born. To a baby piece of art the art monster can be particularly devastating. Those brave souls who dare to study the art monster have found only one weakness in its vast metallic body: the “magical so what formula“. It works like this. The it’s no good monster slithers into the room focused on an unsuspecting baby art. The baby art is displayed proudly. It sits, waiting to be seen, trying not to tremble with too much excitement. The It’s no good monster begins to criticize: The lines are wrong. The proportioning is off. The colors are bad. The work is bad. IT’S NO GOOD! In the past you might have tried to parry words with the it’s no good monster. This is a trap that never works. The it’s no good monster does not care. It ignores your reasoning and attacks the art even more viciously than before. When the it’s no good monster begins to criticize respond with the magical SO WHAT? formula as quickly as possible. I.N.G. Monster: The lines are bad. I.N.G. Monster: The proportioning is off. I.N.G. Monster: The colors are bad. At this point the artist could even throw in an “I like it that way.” or “That’s on purpose” formula in there. The monster will most likely get to its main weapon now. I.N.G. Monster: IT’S NO GOOD. The it’s no good monster will have nothing left to respond with, so it’s best at this point to throw in a few “I like it” and “it’s beautiful”. The monster, having been defeated, will slither back to it’s smelly cave. It might try a few more things if it is a particularly nasty beastie, or, it might slither out again in five minutes ready for another round. Stick with the so what? magical formula. The monster cannot really deal with it. I had my most recent fight with the it’s no good monster yesterday. I made a new comic in Goth Gal, like I do every Friday. It had been a struggle to create a comic that day. I was feeling pretty down and I find it particularly difficult to be funny when I am down. However, I had managed create a comic and to publish it before 7pm–the day was beginning to look up. I stretched and waited for people laugh at it, like it, comment on it–the works. Nothing happened online. Normally I at least get one or two likes. (at the time of this posting there is actually one like, but there wasn’t yesterday.) No one around me got it either. I don’t know why. I thought it was ok. Certainly not as great as some of the comics, but not bad either. Still, everyone has off days. I doubt if there is a single comic in existence that is 100% funny 100% of the time. I’ve realized that this imperfection thing is normal. Being human is all about contradictions. I am kind, cruel, afraid, courageous, powerful, weak, confident and hesitant all at the same time. And that’s ok. I came across a post today on tumlbr’s post it forward page that said something like “artists can get hung up on the imperfections, but those imperfections are part of what make the masterpiece.” The post was referring to one’s body, but I think it can apply to anything anyone makes. The point is: you can’t let the inevitable imperfections keep you from creating. Sometimes I feel like it’s no good, but SO WHAT? I did it. I made that thing. I created something that wasn’t there before I put it there. I pushed myself to use my talent, to do something I enjoy, to make art. It does not matter if it’s good or right or near perfect, it matters that I made it. It matters that I keep making it, despite the doubts and fears and it’s no good monsters that I, as an artist, face every day. Sometimes I am not funny…and that’s ok.